I like this dedication, acknowledging that the book originated as a series of short stories. 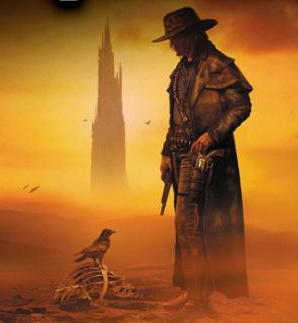 Overview: In a barren, post-apocalyptic world, a lone gunslinger, who is part cowboy from the American west, part medieval knight, is on a quest, tracking down the mysterious Man In Black, with an eventual goal of reaching the Dark Tower. Critique: My opinion is the opposite of most people’s. 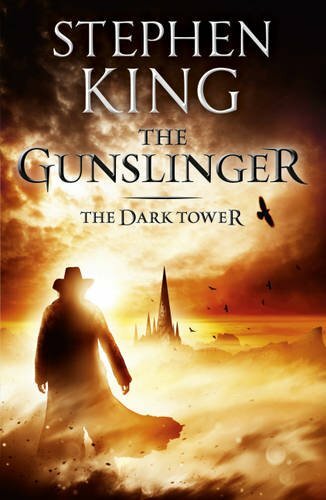 The common opinion from most critics is that THE GUNSLINGER is a bit flawed, feeling more like a prologue, with the story not fully kicking in until Books Two and Three. In fact, it’s my personal favorite of the series! Yes, it’s a bit of an odd entry, and it seems particularly strange that such major characters as Eddie and Susannah are not introduced yet, but this book has such a beautiful hypnotic, dream-like feel. 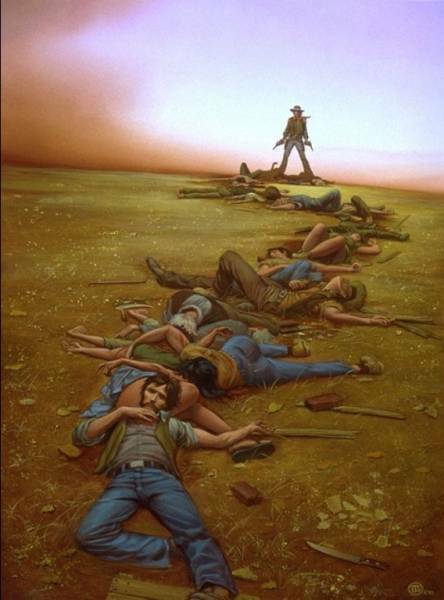 It’s hard to articulate the affect that THE GUNSLINGER had on me at 14 years of age. Coming immediately after LORD OF THE RINGS, which was so dense in exposition and backstory, here was a saga that just started with: “Bang! You’re in a strange world with a strange protagonist, obscure quest, and no backstory. Now take it in.” THE GUNSLINGER is such a hauntingly beautiful book because it’s shrouded in mystery with a hypnotic atmosphere that seems foreign to even the narrator. We follow our hero, a combination of medieval knight and western outlaw, initially unnamed, through a barren wasteland, on a quest to find a strange man, and eventually to reach the Dark Tower. I later learned that King was heavily influenced by Sergio Leone‘s “Man With No Name” films, and indeed, the same way Leone’s bleak and gritty westerns clashed with their Hollywood counterparts, so did THE GUNSLINGER clash with Tolkein’s vision of fantasy storytelling. Editions: Initially I used to defend the original 1982 edition of the book, as it was the version I grew up with. However, over time I’ve come to realize that the 2003 edition is in fact superior. It’s much more consistent with the series in content and tone, as well as just better written and is more accessible to newcomers of the series. -Is the shortest book in the series at 55,000 words. -This and THE WASTE LANDS are the only two books of the series to not feature either a prologue or epilogue (though WIZARD AND GLASS‘s prologue only contains material from the previous book). -This and WIZARD AND GLASS are the only two books of the series to not include travel either to or from our world, although it is mentioned. Jake’s flashback, however, does give a portrait of 1977 New York. -This and SONG OF SUSANNAH are the only two books of the series to be just a straight collection of chapters, not divided into larger Sections or Parts. -Roland and Jake are the only characters to appear in all seven books. Whether or not Walter appears in all seven is arguable, but his biggest role is definitely in this book. -The 2003 edition makes it clear that Walter and Marten are the same character. The 1982 edition didn’t; in fact this remained a confusing contradiction throughout the series until SONG OF SUSANNAH made it clear, at least for me. The 1982 version also made reference to a figure known as the Beast, who we never hear from again. In 2003 this is changed to the Crimson King, who is the main adversary of the series. -SK draws from different nationalities in the fictional culture of this world. Gilead and New Canaan are Biblical names. Roland, Alain, and Gabrielle are names of French origin, while Cuthbert is an Anglo-Saxon name. Roland’s father was originally named Roland the Elder, but was later retcon-ed to the more Anglo name Steven. -MINOR SPOILER FOR LATER BOOKS: Although we do not know it yet, this book technically features the first appearance of Mia and begins the Mordred plotline. Mia doesn’t appear again until she makes a vocal cameo in WOLVES OF THE CALLA, and finally appears in person in SONG OF SUSANNAH. The Book Itself: Some may not like its artsy, visual writing style or may feel the story has not yet found its voice. 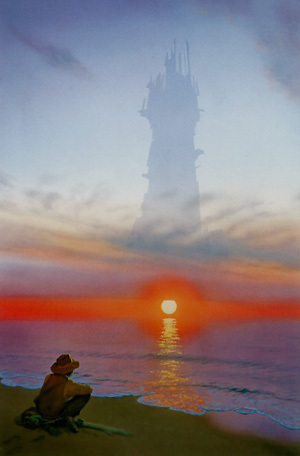 As for me, I find the book a beautiful snapshot of a strange world, and it remains my favorite. Verdict: This is the BEST book of the seven. Afterword/Foreword: The series is notable for the way King used the device of the afterword through each installment. Each afterword is worth critiquing on its own. The 1982 edition featured the single greatest afterword of King’s career. King discusses how this book is the first installment of what he envisions as a great saga, and goes into detail about how the premise came to him in the winter of 1970, alone in a cabin with a large supply of paper and Robert Browning’s CHILDE ROLAND poem on his mind. “But during that spring semester, a sort of hush fell over my previously busy creative life – not a writer’s block, but a sense that it was time to stop goofing around with a pick and shovel and get behind the controls of one big great God a’mighty steamshovel, a sense that it was time to try and dig something big out of the sand, even if the effort turned out to be an abysmal failure. This afterword really resonated with me as a fellow writer; I knew what it was like to have this great story you want to create, even if only a small amount has been revealed to you. The book feels like a piece of a larger puzzle, one that the author himself is still discovering. The afterword plays a role in that feeling, and tells you that more will come, even if it hasn’t been created yet. The 2003 edition replaces this afterword with a foreword entitled “On Being Nineteen,” which serves as a nice flip-side to the original afterword, giving you his thoughts on completing the journey. Verdict: This is the BEST afterword/foreword of the entire series. 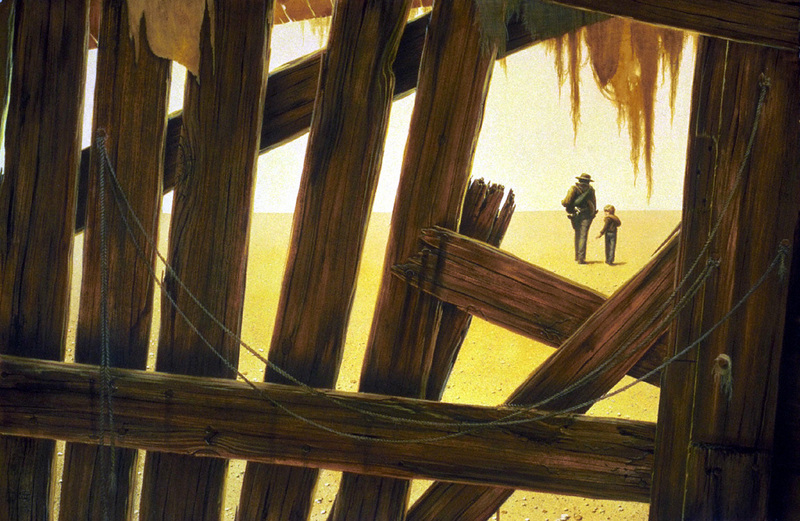 Illustrations: Both this book and the final one feature illustrations by Michael Whelan, and they are to die for! 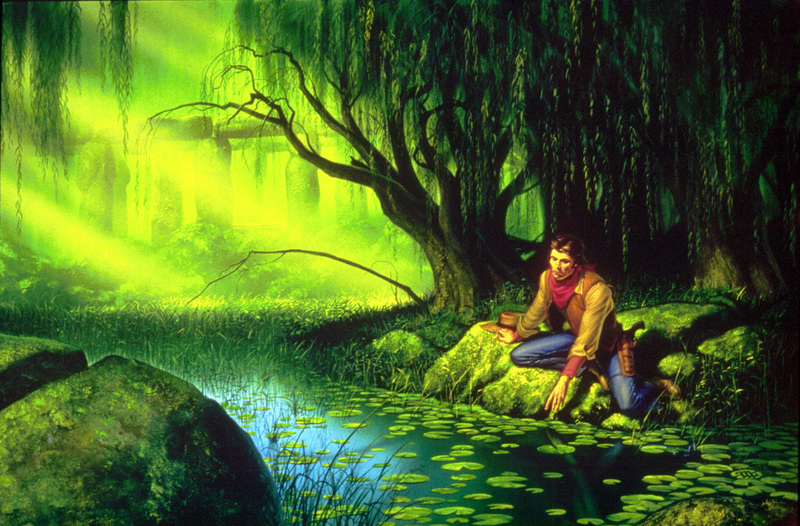 Whelan specialized in “imaginative realism” and is also known for his work on Meat Loaf‘s albums. His artwork here, which you can see throughout this blog article, is very rich and lush, serving both as scene depictions from the novel and as stand alone works of art. Verdict: Both this book and DT7 are tied for BEST and SECOND BEST illustrations of the seven. Click here for the next book in the series, for three is the number of your fate.